Late last week, Redbird’s Chief Creative Officer, Jenna Briand, traveled to San Antonio, Texas to attend an annual convention held by longtime client, California Closets. 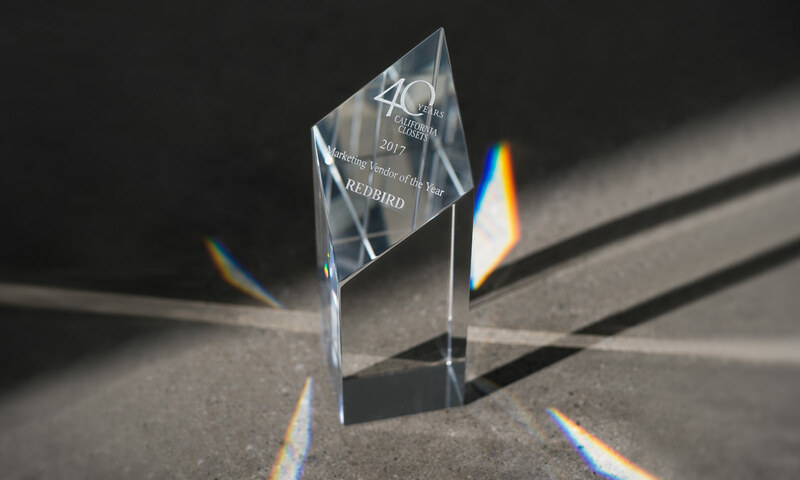 There, on behalf of the entire team, Jenna accepted an award for Marketing Vendor of the Year, presented to Redbird by California Closets Chief Marketing Officer, Samara Toole. This honor — both unexpected and deeply appreciated — comes 4 months after Redbird and California Closets celebrated the release of Ideas of Order, a branded publication that was declared Best Print Magazine: Editorial and Design by the Pearl Awards Content Council. For more than a decade, California Closets has called on Redbird for support related to research, strategy, production, and design. With every collaboration, our energy has proven prolific. Needless to say, we’re thrilled to lend our ongoing support to such a courageous and collaborative brand, and to California Closets, we say: thanks — we appreciate you. Redbird is a women-owned and run business that helps big brands be more human. We are based in Culver City, CA with outposts in Seattle and New York. Follow @redbirdgroup for the latest news, insider look at the agency happenings and more. © 2019 Redbird Group LLC. All rights reserved.